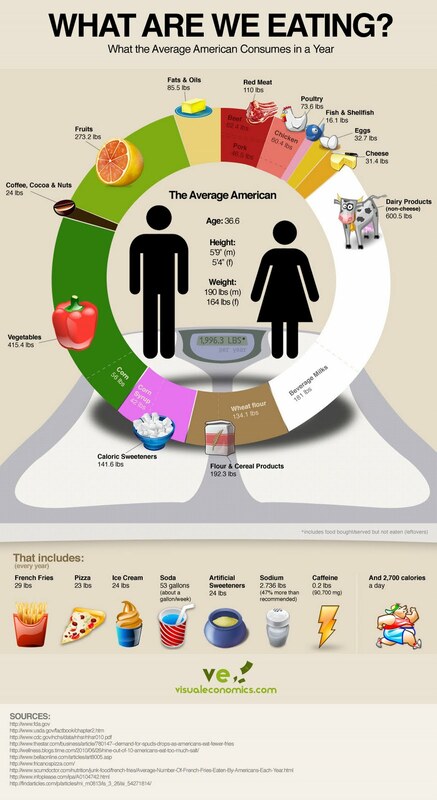 I found this visual representation of what the average American eats in a year while browsing the Crossfit Boston site…and to tell you the truth, I was actually surprised. I prepared myself for the worst, but what I saw in this chart was even more atrocious than I expected. The average male is 5’9″ and weighs 190lbs, while the average female is 5’4″ and weighs 164lbs. The average American consumes 600.5lbs of non-cheese dairy products per year. Were you surprised at any of these findings? 0 Responses to Are You Average? this is sickening – thanks for sharing!